I haven't completely embraced the shrub, but I put my toe in the water with this tangerine and chamomile cocktail and wasn't sorry. Plus, this libation can be batched, making it easy to share an after-work drink! Combine ingredients in a swing-top bottle or mason jar. Gently swirl to combine, and refrigerate for up to 4 days. 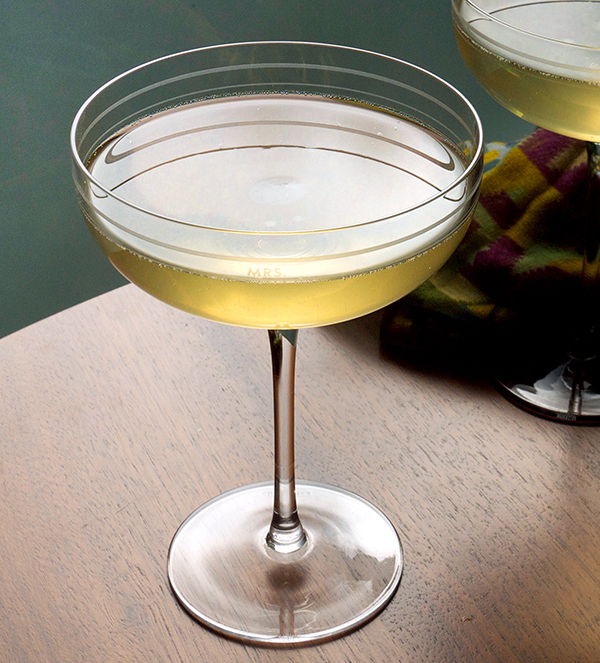 To serve, top 2 3/4 oz tangerine-chamomile shrub with cava in a coupe glass. Notes: To make the chamomile-tangerine syrup, combine 1 cup of sugar and 3/4 cup of water in a small saucepan; bring to a simmer and stir occasionally until sugar is dissolved. Take off the heat and add 4 chamomile tea bags, zest of 2 tangerines, and 1/4 cup of freshly squeezed tangerine juice. Steep tea for 6 minutes, then cover and let stand for 30 minutes. Refrigerate for up to 30 days–cheers! Image and recipe from Stir and Strain.